The Nilgiri Langur, also known as Indian Hooded Leaf Monkey, John’s Langur and Black Leaf Monkey, is an attractive black Colobine monkey with a pale gold mane. The rump and base of the tail are white, and females have white highlights on their inner thighs which are present from an early age. These langurs form groups with one dominant male and around 20 females, with the sub-adult and subordinate males forming bachelor groups. 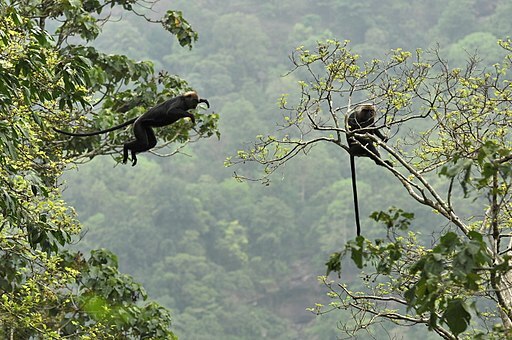 These troops move through the forest feeding on leaves of about 100 plant species (which gives rise to their name ‘Black Leaf Monkey’) as well as fruits, flowers and seeds. The troops mainly move in the late afternoon because the langurs begin to head to their sleeping areas, where they engage in social activities like play, grooming and infant-mother association as well as rest. Vocalisation plays a major role in establishing and maintaining the social hierarchies of groups, with female-female interactions escalating into long screeching and squealing exchanges that are reconciled only when the male gives a specific call. 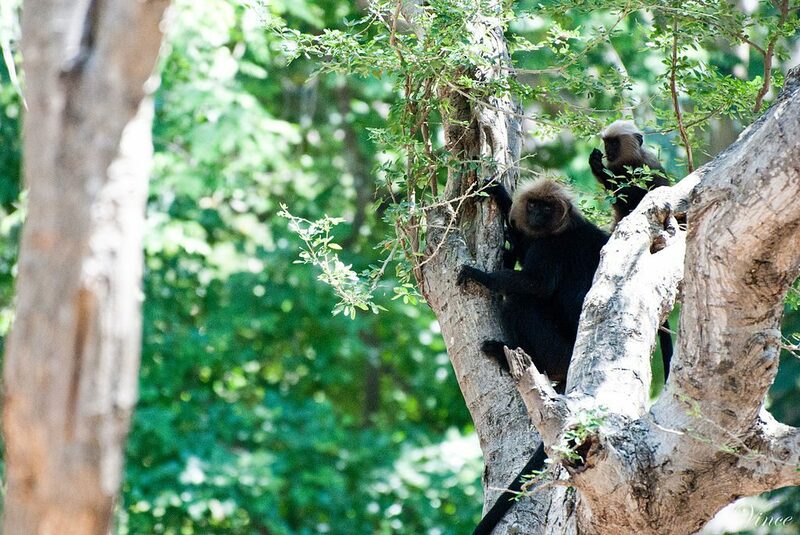 The home range of Nilgiri Langurs is between two and six hectares, which varies according to how concentrated the sources of preferred food are and the density of langur troops in the area. They only occur in the Western Ghats of southwestern India, next to the Mudahalli Elephant Corridor. The Nilgiri Langurs are hunted for their skin to use for drums, and other parts of their bodies are used for traditional ‘medicine’, which has led them to be classified as Vulnerable by the IUCN Red List of Threatened Species as there may be only 5,000 left in the wild. They have been affected by habitat loss due to crop plantations, mining, dams, and human settlements but they are good dispersers and are able to colonise new areas, which makes them better adapted than primates like the lion-tailed macaques.